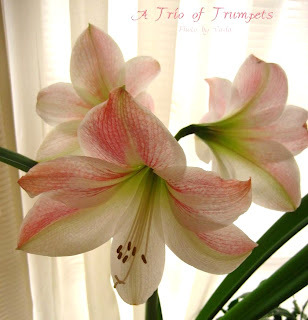 This amaryllis was a gift for Christmas, three years ago, so this is it's fourth blooming. Just as lovely as before, the blooms measure almost 8 inches across. I set it ourside for a while, after the weather warms, and give it a dormant period in the fall. Tucked away in corner, it wakes up right on schedule in late December. Warm, 50* or more today, great day to be outdoors, or take a walk. We had some rain yesterday. Typical, changable January-in-Kentucky weather. It's been quite a while since my last posting here. We have 3 or 4 inches of snow, about 20 degrees today. This morning a flock of robins arrived, and were feeding on the berries in the small trees in my front yard. It was cloudy then, and I did not get pictures of them. Here's a shot of a few in the neighbor's holly tree this afternoon. The birdhouse, as well as my own, has icycles. And the quirrel was enjoying the seeds I scattered for the other birds. We made an afternoon jaunt to a farm to attend a stallion open house, which included Team Valor's Visionaire. 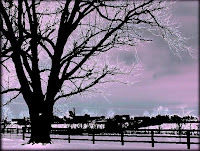 And here are a couple of scenes I captured from the barn, both manipulated with PhotoImpressions effects. Cloudy enough to not get good shots, but less-than-perfect images can be fun to 'enhance'.